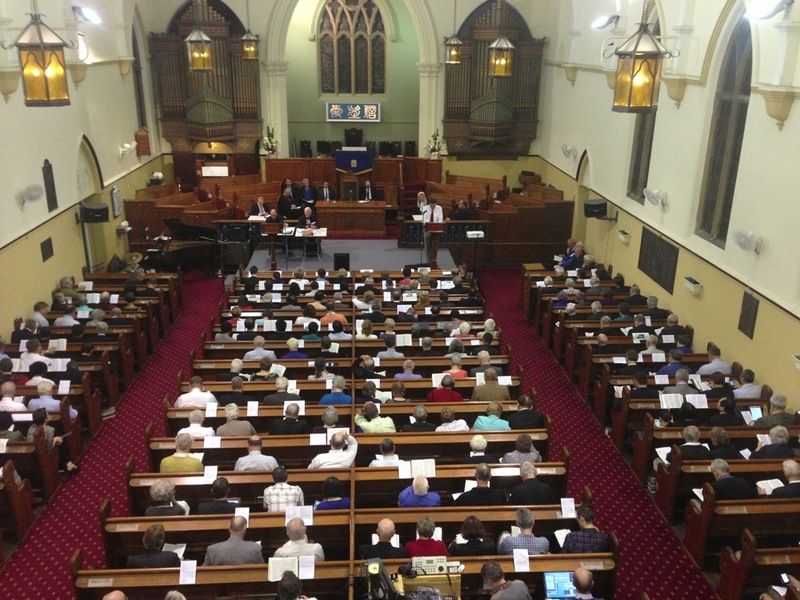 On a balmy spring night in Sydney the Chinese Presbyterian Church, Surry Hills, was comfortably full to witness the commencement of the 48th Session Of The General Assembly Of The Presbyterian Church Of Australia. 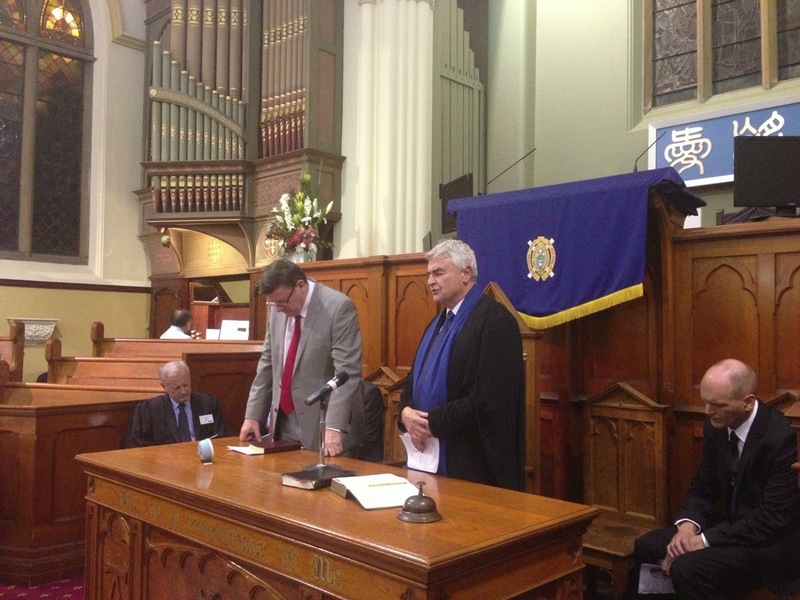 We were encouraged by a brief address from outgoing moderator-general David Jones and the keynote sermon from incoming moderator-general David Cook. While the two messages marked a transition in leadership, they also confirmed a continuity of conviction in the power of Bible-centered Gospel proclamation. 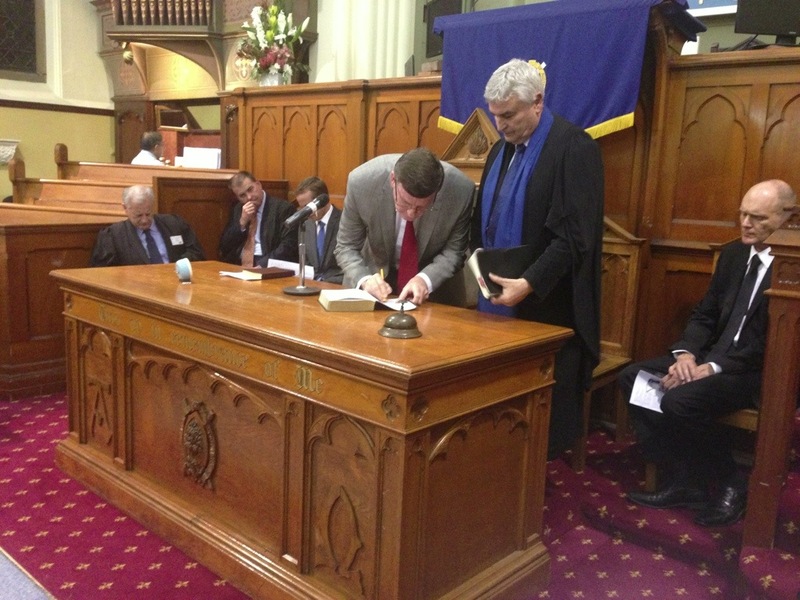 The Presbyterian Church in Australia is in the midst of a rich six years of Biblical teaching and encouragement from the moderator of its National General Assembly. David Jones brought our attention to Titus 1:1-4 in order to answer the question Why Are We Here?. Firstly we are here for evangelism: …that God’s elect might come to faith through the preaching of the Gospel. Paul exhorts Titus that Cretans must become Christians. And they must do so in the context of a culture that their own people described as being broken and bankrupt. How to reach a broken culture (now and then)? By the Gospel. Paul give Titus and the church a prayer and a charge: not just evangelical, but evangelistic. Secondly we are here for edification: That new believers will grow in their knowledge of the faith. How to do that in a culture that teaches us not to value truth? Teach them about the blood that has been shed, for the forgiveness of their sins. How to do that in culture that encourages us to live selfishly? Teach them about the Trinity. God is love. The Gospel can change them to show the care and mutual service of the godhead. Gospel truth, not Christian values changes people. Thirdly we are here for the hope of eternal life. Jesus has not only freed us, he has changed us, our destiny and the destiny of the generations that proceed from us. By the proclamation of our eternal hope we nurture the Godly to embrace the glory to come. David Cook’s sermon, The Apostolic Pattern, was preached from Acts 20:17-38. What is the Apostolic pattern for soul care? Teacher. The words used to describe Paul’s activity: preach, proclaim, taught, declaration, testimony. Where does the content of this activity come from? The Bible. It’s a word based ministry. A body of truth to be understood. A developed theology drawn on in trial. Lack of knowledge leads to doubt. Watchman. An activity of warning. With every effort and tears. You’re only innocent as a watchman if you sound the warning. There is a need to be convicted of the danger that Christians face in their lives. There is no room for complacency. Shepherd. Watch yourself first. Don’t urge others to do what you don’t do yourself. These warning for ourselves and for others flow from Word based warnings derived from the teaching of the Bible. One to one ministry is also essential for this. Endurance athlete. We must keep doing all these things, actively now, but continuously. The key to being able to do this is that we are not our own. Christ’s love compels us. We cannot claim the benefits of being bought with the blood of Christ without accepting that we are no longer our own. Teach, watch over, shepherd, and all of these diligently. It was poignant and telling that when Anglican Bishop Peter Tasker responded on behalf of welcomed church leaders, the Bible verse he said many had commended to him as summarising David Cook’s life and ministry was from the very passage in Acts 20 that David had preached from. Songs included Name Of All Majesty, God Is Working His Purpose Out, There Is A Higher Throne, and O Christ In Thee My Soul Hath Found, accompanied on both grand piano and pipe organ. I was told I sang loudly, but I don’t think that was a negative. One friend volunteered that next time he might sit two rows in front of me. Afterwards various necessary items of business were dealt with, including the announcement that the letter from Paul Logan, Clerk of the General Assembly indicating his resignation from the post as of the end of 2014 will be dealt with at 5.00pm tomorrow. 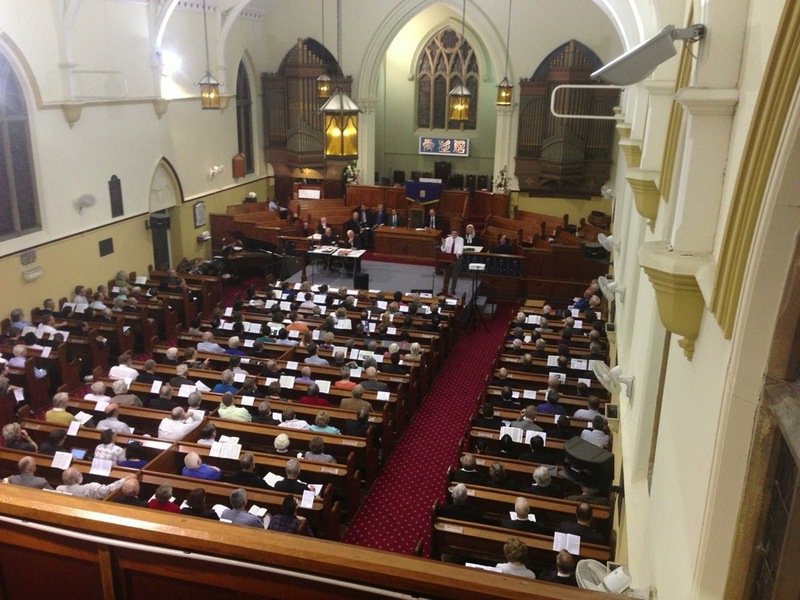 Categories: Acts, Assembly, Presbyterian Church Of Australia, Titus | Permalink. Good to know. But enough with the serious stuff. Selfies. That’s what we’re looking for. Set yourself a challenge: a collection of selfies with people from each state and territory. You can do it. You remember what happened to the last person in Australia who became famous for selfies, don’t you?